A dog can fill a home with joy, laughter, and plenty of wonderful memories. However, four-legged friends can also wreak havoc on your flooring, leading to carpet stain removal and cleaning. 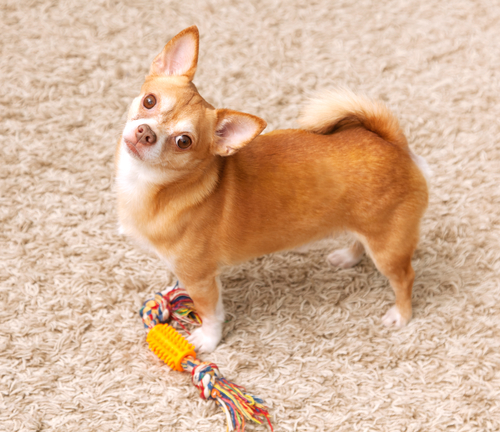 Here are a few essential tips to protect your carpet from your pups and keep your floors looking great all year long. Even the most well-behaved dog can have accidents every so often, leading to stubborn stains in your home. Fortunately, you can reach out to professional carpet cleaners to schedule routine, targeted stain removal every three to six months. Even if you don’t need a full steam cleaning, a team of experts will treat urine spots, grass and dirt buildup, and other pet stains in your home. Whether your dog routinely sheds their entire coat or they’re a hypoallergenic breed, you should vacuum your carpets as often as possible to reduce the buildup of fur, dirt, and other debris that can work its way deep into the layers of your carpets. Ideally, you should vacuum every other day, but one to two times per week will keep your floors looking (and smelling) their best. Make your life easier by asking a floor installation professional about stain-resistant carpets. Made from soft, durable, easy-to-clean materials, this type of carpeting offers superior spill protection due to their low absorption. If you love your dog and clean carpets, you can have your cake and eat it too. The best way to treat your flooring is to reach out to a team of carpet cleaners for regular steam cleanings every six to 12 months. A full cleaning will get rid of any lingering odors, stains, and debris your vacuum missed, leaving you with a gleaming, beautiful home for you and your dog. With over 10 years of experience in carpet cleaning, the team at Integrity Carpet Care, based in Indianapolis, IN, believe in quality work and winning customer service. They offer a range of residential and commercial carpet cleaning services, including carpet stain removal and 24/7 emergency water extractions. To speak with a friendly representative, call (317) 730-2570, or visit the website to learn more about their work.